Kareem Abdul-Jabbar (born Ferdinand Lewis Alcindor, Jr.; April 16, 1947) is a retired American professional basketball player who played 20 seasons in the National Basketball Association (NBA) for the Milwaukee Bucks and Los Angeles Lakers. During his career as a Center (basketball), Abdul-Jabbar was a record six-time NBA Most Valuable Player (MVP), a record 19-time NBA All-Star, a 15-time All-NBA selection, and an 11-time NBA All-Defensive Team member. A member of six NBA championship teams as a player and two as an assistant coach, Abdul-Jabbar twice was voted NBA Finals MVP. In 1996, he was honored as one of the 50 Greatest Players in NBA History. NBA coach Pat Riley and players Isiah Thomas and Julius Erving have called him the greatest basketball player of all time. After winning 71 consecutive basketball games on his high school team in New York City, Lew Alcindor attended college at UCLA, where he played on three consecutive national championship basketball teams and was a record three-time MVP of the NCAA Tournament. Drafted by the one-season-old Bucks franchise in the 1969 NBA Draft with the first overall pick, Alcindor spent six seasons in Milwaukee. After winning his first NBA championship in 1971, he adopted the Muslim name Kareem Abdul-Jabbar at age 24. Using his trademark "skyhook" shot, he established himself as one of the league's top scorers. In 1975, he was traded to the Lakers, with whom he played the last 14 seasons of his career and won five NBA championships. Abdul-Jabbar's contributions were a key component in the "Showtime" era of Lakers basketball. Over his 20-year NBA career his team succeeded in making the playoffs 18 times and past the 1st round in 14 of them; his team reached the NBA Finals 10 times. At the time of his retirement in 1989, Abdul-Jabbar was the NBA's all-time leader in points scored (38,387), games played (1,560), minutes played (57,446), field goals made (15,837), field goal attempts (28,307), blocked shots (3,189), defensive rebounds (9,394), and personal fouls (4,657). He remains the all-time leading scorer in the NBA, and is ranked 3rd all-time in both rebounds and blocks. In 2007 ESPN voted him the greatest center of all time, and in 2008 they named him the "greatest player in college basketball history". 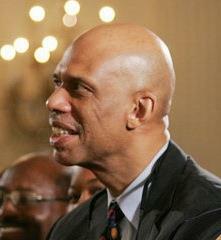 Abdul-Jabbar has also been an actor, a basketball coach, and a best-selling author. In 2012, he was selected by Secretary of State Hillary Clinton to be a U.S. global cultural ambassador. Ferdinand Lewis Alcindor, Jr. was born on on April 16, 1947, and grew up in New York City, the only child of Cora Lillian, a department store price checker, and Ferdinand Lewis Alcindor, Sr., a transit police officer and jazz musician. At birth, he weighed 12 pounds, 10 ounces (5.73 kg), and was twenty-two-and-a-half inches (57.2 cm) long. He was raised as a Roman Catholic and attended Power Memorial Academy, a Catholic high school in Manhattan. In the summer of 1968, while attending UCLA, he took the Shahada twice and converted to Sunni Islam, only later making his name change official. From an early age he began his record-breaking basketball accomplishments. In high school, which he started as a 6 foot 8 inch player, he led Power Memorial Academy to three straight New York City Catholic championships, a 71-game winning streak, and a 79–2 overall record. This earned him a nickname — "The tower from Power." His 2,067 total points were a New York City high school record. The team won the national high school boys basketball championship when Alcindor was in 11th grade, and were runner-up his senior year. Lew Alcindor played four seasons for the UCLA Bruins; on the freshman team in 1965–66 and from 1966–69 under coach John Wooden, contributing to the team's three-year record of 88 wins and only two losses: one to the University of Houston in which Alcindor had a not fully healed eye injury (see below), and the other to crosstown rival USC who played a "stall game" (i.e., there was no shot clock in those days, so a team could hold the ball as long as it wanted before attempting to score). In his first college game Lew set a UCLA single game record with 56 points. Lew Alcindor (Jabbar) with the reverse two hand dunk in a game against Stanford. During his college career, Alcindor was twice named Player of the Year (1967, 1969); was a three-time First Team All-American (1967–69); played on three NCAA basketball champion teams (1967, 1968, 1969); was honored as the Most Outstanding Player in the NCAA Tournament (1967, 1968, 1969); and became the first-ever Naismith College Player of the Year in 1969. In 1967 and 1968, he also won USBWA College Player of the Year which later became the Oscar Robertson Trophy. Alcindor became the only player to win the Helms Foundation Player of the Year award three times. The 1965–66 UCLA Bruin team was the preseason #1. But on November 27, 1965, the freshman team led by Alcindor defeated the varsity team 75–60 in the first game in the new Pauley Pavilion. Alcindor scored 31 points and had 21 rebounds in that game. Alcindor had considered transferring to the University of Michigan, because of unfulfilled promises from recruiting. UCLA player Willie Naulls introduced Alcindor and teammate Lucius Allen to businessman Sam Gilbert, who convinced the pair to remain at UCLA. 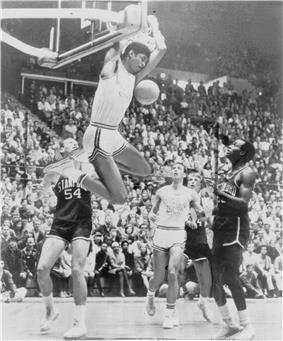 The dunk was banned in college basketball after the 1967 season, primarily because of Alcindor's dominant use of the shot. It was not allowed again until 1976. While playing for UCLA, Alcindor suffered a scratched left cornea on January 12, 1968, at the Cal game when he was struck by Tom Henderson of Cal in a rebound battle. He would miss the next two games against Stanford and Portland. This happened right before the momentous game against Houston. His cornea later would be scratched again during his pro career, subsequently causing him to wear goggles for protection. Alcindor boycotted the 1968 Summer Olympics by deciding not to join the United States Men's Olympic Basketball team that year, protesting the unequal treatment of African-Americans in the United States. Along with playing basketball, Alcindor earned a Bachelor of Arts with a major in history from UCLA in 1969. In his free time he practiced martial arts. He studied Jeet Kune Do under Bruce Lee. On January 20, 1968, Alcindor and the UCLA Bruins faced the Houston Cougars in the first-ever nationally televised regular-season college basketball game. In front of 52,693 fans at the Houston Astrodome, Elvin Hayes scored 39 points and had 15 rebounds—while Alcindor, who suffered from a scratch on his left cornea, was held to just 15 points—as Houston beat UCLA 71–69. The Bruins' 47-game winning streak ended in what has been called the "Game of the Century". Hayes and Alcindor would have a rematch in the 1968 NCAA Men's Division I Basketball Tournament where UCLA, with a healthy Alcindor, would defeat Houston in the semi-finals 101–69 and go on to win the National Championship. 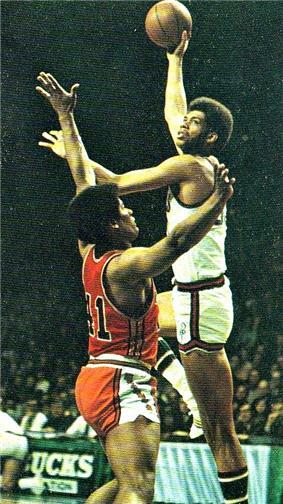 Abdul-Jabbar (right) being guarded by Wes Unseld (left). The Harlem Globetrotters offered Alcindor $1 million to play for them, but he declined, and was picked first in the 1969 NBA Draft by the Milwaukee Bucks (who were in only their second season of existence.) The Bucks won a coin-toss with the Phoenix Suns for first pick. He was also chosen first overall in the 1969 American Basketball Association draft by the New York Nets. The Nets believed that they had the upper hand in securing Alcindor's services because he was from New York; however, when Alcindor told both the Bucks and the Nets that he would accept one offer only from each team, the Nets bid too low. Sam Gilbert negotiated the contract along with Los Angeles businessman Ralph Shapiro at no charge. After Alcindor chose the Milwaukee Bucks offer of $1.4 million, the Nets offered a guaranteed $3.25 million. He declined the offer, saying, "A bidding war degrades the people involved. It would make me feel like a flesh peddler, and I don't want to think like that." Lew Alcindor's entry into the NBA was timely, as center Bill Russell had just left the Boston Celtics, and Wilt Chamberlain, though still effective, was 33 years old. Alcindor's presence enabled the 1969–70 Bucks to claim second place in the NBA's Eastern Division with a 56–26 record (up from 27–55 the previous year); and he was an instant star, ranking second in the league in scoring (28.8 ppg) and third in rebounding (14.5 rpg), for which he was awarded the title of NBA Rookie of the Year. The next season, the Bucks acquired All-Star guard Oscar Robertson, known to sports fans as "the Big 'O'." Milwaukee went on to record the best record in the league with 66 victories in the 1970–71 NBA season, including a then-record 20 straight wins. Alcindor was awarded his first of six NBA Most Valuable Player Awards, along with his first scoring title (31.7 ppg). He also led the league in total points, with 2,596. In the playoffs, the Bucks went 12–2 (including a four-game sweep of the Baltimore Bullets in the NBA Finals), won the championship, and Alcindor was named Finals MVP. On May 1, 1971, the day after the Bucks won the NBA championship, he adopted the Muslim name Kareem Abdul-Jabbar (Arabic: كريم عبد الجبار‎, Karīm ʿAbd al-Jabbār), its translation roughly "generous/noble (Kareem), servant of (Abdul) the mighty/stern one (Jabbar) [i.e., of God]." He had previously converted to Islam while at UCLA. Abdul-Jabbar at the free throw line in 1974. Abdul-Jabbar remained a dominant force for Milwaukee, repeating as scoring champion (34.8 ppg and 2,822 total points) and NBA Most Valuable Player the following year, and helping the Bucks to repeat as division leaders for four straight years. In 1974, Abdul-Jabbar won his third MVP Award in five years and was among the top five NBA players in scoring (27.0 ppg, third), rebounding (14.5 rpg, fourth), blocked shots (283, second), and field goal percentage (.539, second). While remaining relatively injury-free throughout his NBA career, Abdul-Jabbar twice broke one of his hands. The first time was during a pre-season game in 1974, when he was bumped hard and got his eye scratched, which angered him enough to punch the basket support stanchion. When he returned, after missing the first 16 games of the season, he started to wear protective goggles. The second time he broke a hand was in the opening game of the 1977–78 NBA season. Two minutes into the game, Abdul-Jabbar punched Milwaukee's Kent Benson in retaliation for an overly aggressive elbow, causing Benson's jaw to be broken. Abdul-Jabbar broke a hand in the incident and was out for two months; otherwise, he could have potentially been suspended by the NBA. Although Abdul-Jabbar always spoke well of Milwaukee and its fans, he said that being in the Midwest did not fit his cultural needs and requested a trade to either New York or Los Angeles in October 1974. In 1975, the Lakers acquired Abdul-Jabbar and reserve center Walt Wesley from the Bucks for center Elmore Smith, guard Brian Winters, and rookie "blue chippers" Dave Meyers and Junior Bridgeman. In the 1975–76 season, his first with the Lakers, he had a dominating season, averaging 27.7 points per game and leading the league in rebounding, blocked shots, and minutes played. His 1,111 defensive rebounds remains the NBA single-season record (defensive rebounds were not recorded prior to the 1973–74 season). Also it marked the last time anyone had 4,000 or more PRA (Points + Rebounds + Assists) in a single NBA season. He earned his fourth MVP award, but missed the post-season for the second straight year. Magic Johnson (right) passing the ball to Abdul-Jabbar (left) in the post. 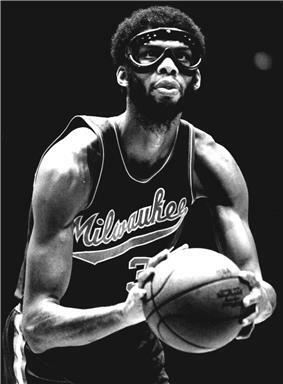 Once he joined the Lakers, Abdul-Jabbar began wearing his trademark goggles (he briefly ditched them in the 1979–80 season). Years of battling under NBA backboards, and being hit and scratched in the face in the process, had taken their toll on his eyes and he developed corneal erosion syndrome, where the eyes begin to dry out easily and cease to produce moisture. He missed one game in the 1986–87 season due to his eyes drying out and swelling as a result. In the 1976–77 season, Abdul-Jabbar had another strong season. He led the league in field goal percentage, finished second in rebounds and blocked shots, and third in points per game. He helped lead the Lakers to the best record in the NBA, and he won his record-tying fifth MVP award. In the playoffs, the Lakers beat the Golden State Warriors in the Western Conference semi-finals, setting up a confrontation with the Portland Trail Blazers. The result was a memorable matchup, pitting Abdul-Jabbar against a young, injury-free Bill Walton. Although Abdul-Jabbar dominated the series statistically, Walton and the Trail Blazers (who were experiencing their first-ever run in the playoffs) swept the Lakers, behind Walton's skillful passing and leadership. In 1979, the Lakers acquired 1st overall draft pick Earvin "Magic" Johnson. The trade and draft paved the way for a Laker dynasty as they went on to become one of the most dominant teams of the 1980s, appearing in the finals eight times and winning five NBA championships. Individually, while Abdul-Jabbar was not the dominant center he had been in the 1970s, he experienced a number of highlight moments. Among them were his record sixth MVP award in 1980, four more All-NBA First Team designations, two more All-Defense First Team designations, the 1985 Finals MVP, and on April 5, 1984 breaking Wilt Chamberlain's record for career points. Later in his career, he bulked up to about 265 pounds, to be able to withstand the strain of playing the highly physical center position into his early 40s. While in L.A., Abdul-Jabbar started doing yoga in 1976 to improve his flexibility, and was notable for his physical fitness regimen. He says, "There is no way I could have played as long as I did without yoga." In 1983, Abdul-Jabbar's house burned down, destroying many of his belongings including his beloved jazz LP collection (about 3,000 jazz albums were destroyed). Many Lakers fans sent and brought him albums, which he found uplifting. On June 28, 1989, after twenty professional seasons, Abdul-Jabbar announced his retirement. On his "retirement tour" he received standing ovations at games, home and away and gifts ranging from a yacht that said "Captain Skyhook" to framed jerseys from his basketball career to an Afghan rug. In his biography My Life, Magic Johnson recalls that in Abdul-Jabbar's farewell game, many Lakers and Celtics legends participated. 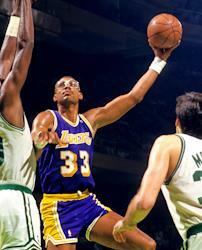 Every player wore Abdul-Jabbar's trademark goggles and had to try a skyhook at least once, which led to comic results. The Lakers made the NBA Finals in each of Abdul-Jabbar's final three seasons, defeating Boston in 1987, and Detroit in 1988. The Lakers lost to the Pistons in a four-game sweep in his final season. Since 2005, Abdul-Jabbar has served as special assistant coach for the Lakers. 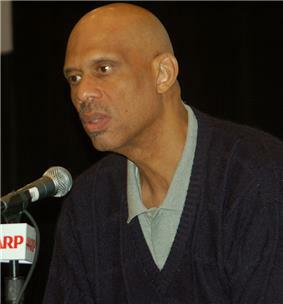 Abdul-Jabbar had been interested in coaching since his retirement, and given the influence he had on the league, he thought that the opportunity would present itself. However, during his playing years, Abdul-Jabbar had developed a reputation of being introverted and sullen. He did not speak to the press, leading to the impression that he disliked them. In his biography My Life, Magic Johnson recalls instances when Abdul-Jabbar brushed him off when Magic (as a ball boy) asked for his autograph, Abdul-Jabbar froze out reporters who gave him a too enthusiastic handshake or even hugged him, and refused to stop reading the newspaper while giving an interview. Many basketball observers, in addition to Abdul-Jabbar, believe that Kareem's reticence, whether through disdain for the press corps or simply because of introversion, contributed to the dearth of coaching opportunities offered to Abdul-Jabbar by the NBA. In his words, he said he had a mindset he could not overcome, and proceeded through his career oblivious to the effect his reticence may have had on his coaching prospects in the future. Abdul-Jabbar said: "I didn't understand that I also had affected people that way and that's what it was all about. I always saw it like they were trying to pry. I was way too suspicious and I paid a price for it." Since he began lobbying for a coaching position in 1995, he has managed to obtain only low-level assistant and scouting jobs in the NBA, and a head coaching position only in a minor professional league. Abdul-Jabbar has worked as an assistant for the LA Clippers and the Seattle SuperSonics, helping mentor, among others, their young centers, Michael Olowokandi and Jerome James. Abdul-Jabbar was the head coach of the Oklahoma Storm of the United States Basketball League in 2002, leading the team to the league's championship that season, but he failed to land the head coaching position at Columbia University a year later. He then worked as a scout for the New York Knicks. Finally, on September 2, 2005, he returned to the Lakers as a special assistant to Phil Jackson to help the Lakers' centers, and in particular their young draftee Andrew Bynum. Abdul-Jabbar's influence has been credited with Bynum's emergence as a more talented NBA center. Abdul-Jabbar has also served as a volunteer coach at Alchesay High School on the Fort Apache Indian Reservation in Whiteriver, Arizona in 1998. Abdul-Jabbar played the center position and is regarded as one of the best of all time. He is the all-time leading NBA scorer with 38,387 points, having collected six championship rings, six regular season MVP and two Finals MVP awards, fifteen NBA First or Second Teams, a record nineteen NBA All-Star call-ups and averaging 24.6 points, 11.2 rebounds, 3.6 assists and 2.6 blocks per game. He is ranked as the NBA's third leading all-time rebounder (17,440). He is also the third all-time in registered blocks (3,189), which is even more impressive because this stat had not been recorded until the fourth year of his career (1974). On offense, Abdul-Jabbar was an unstoppable low-post threat. In contrast to other low-post dominators like Wilt Chamberlain, Artis Gilmore or Shaquille O'Neal, Abdul-Jabbar was a relatively slender player, standing 7'2" (218 cm) but only weighing 225 lbs (though in his latter years the Lakers listed Abdul-Jabbar's weight as 265). However, he made up for his relative lack of bulk by showing textbook finesse, strength and was famous for his ambidextrous skyhook shot, which defenders found impossible to block. It contributed to his high .559 field goal accuracy, making him the eighth most accurate scorer of all time and a feared clutch shooter. Abdul-Jabbar was also quick enough to run the Showtime fast break led by Magic Johnson and was well-conditioned, standing on the hardwood an average 36.8 minutes. In contrast to other big men, Abdul-Jabbar also could reasonably hit his free throws, finishing with a career 72% average. Abdul-Jabbar (middle) against the Boston Celtics in the late 1980s. As a teammate, Abdul-Jabbar exuded natural leadership and was affectionately called "Cap" or "Captain" by his colleagues. He was also known for his strict fitness regime, which made him one of the most durable players of all time. In the NBA, his 20 seasons and 1,560 games are performances surpassed only by former Celtics' center Robert Parish. Abdul-Jabbar was well known for his trademark "skyhook", a hook shot in which he bent his entire body (rather than just the arm) like a straw in one fluid motion to raise the ball and then release it at the highest point of his arm's arching motion. Combined with his long arms and great height, 7 feet 2 inches (2.18 m), the skyhook was difficult for a defender to block without goaltending. It was a reliable and feared offensive weapon and contributed to his high lifetime field goal percentage of 0.559. He was adept at shooting the skyhook with either hand, which made him even more difficult to defend against, though as a right-handed player, he was stronger shooting the skyhook with his right hand than he was with his left. According to Abdul-Jabbar, he learned the move in fifth grade after practicing with the Mikan Drill and soon learned to value it, as it was "the only shot I could use that didn't get smashed back in my face". #7 in SLAM Magazine's Top 50 NBA Players of all time in 2009. In 1980, he played co-pilot Roger Murdock in Airplane!. Abdul-Jabbar has a scene in which a little boy looks at him and remarks that he is in fact Abdul-Jabbar—spoofing the appearance of football star Elroy "Crazylegs" Hirsch as an airplane pilot in the 1957 drama Zero Hour!. Staying in character, Abdul-Jabbar states that he is merely Roger Murdock, an airline co-pilot, but the boy continues to insist that Abdul-Jabbar is "the greatest", but that, according to his father, he doesn't "work hard on defense" and "never really tries, except during the playoffs". This causes Abdul-Jabbar's character to snap, "The hell I don't! ", then grab the boy and snarl he has "heard that crap since UCLA", he "busts his buns every night" and the boy should tell his "old man to drag [Bill] Walton and [Bob] Lanier up and down the court for 48 minutes". When Murdock loses consciousness later in the film, he is carried from the cockpit wearing Abdul-Jabbar's goggles and yellow Lakers' shorts. Abdul-Jabbar (center) at the Rally to Restore Sanity and/or Fear with Comedy Central hosts Jon Stewart (right) and Steven Colbert (left). Abdul-Jabbar has had numerous other television and film appearances, often playing himself. He has had roles in movies such as Full House, Living Single, Amen, Everybody Loves Raymond, Martin, Diff'rent Strokes (his height humorously contrasted with that of diminutive child star Gary Coleman), The Fresh Prince of Bel-Air, Scrubs, 21 Jump Street, Emergency!, Man from Atlantis, and New Girl. Abdul-Jabbar played a genie in lamp in a 1984 episode of Tales From The Darkside. He also played himself on the February 10, 1994 episode of the sketch comedy television series In Living Color. He also appeared in the television version of Stephen King's The Stand, played the Archangel of Basketball in Slam Dunk Ernest, and had a brief non-speaking cameo appearance in BASEketball. Abdul-Jabbar was also the co-executive producer of the 1994 TV movie The Vernon Johns Story. He has also made appearances on The Colbert Report, in a 2006 skit called "HipHopKetball II: The ReJazzebration Remix '06" and in 2008 as a stage manager who is sent out on a mission to find Nazi Gold. Abdul-Jabbar also voiced his own character in a 2011 episode of The Simpsons titled "Love Is a Many Strangled Thing". He had a recurring role as himself on the NBC series Guys with Kids, which aired from 2012 to 2013. On Al Jazeera English he expressed his desire to be remembered not just as a player, but somebody who had many talents and used them. 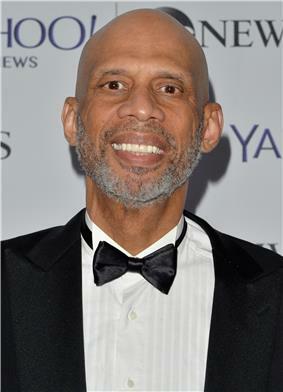 Abdul-Jabbar has also created the 2011 documentary On the Shoulders of Giants, based on the all-black basketball team the New York Renaissance. Abdul-Jabbar has also appeared with Robert Hays (Ted Striker)  in a 2014 "Airplane" parody commercial promoting Wisconsin tourism. Kareem Abdul-Jabbar at a book signing. Abdul-Jabbar is also a best-selling author. His first book, his autobiography Anthony Walton, is a history of an all-black armored unit that served with distinction in Europe. On February 10, 2011, Abdul-Jabbar debuted his film On the Shoulders of Giants, documenting the tumultuous journey of the famed yet often-overlooked Harlem Renaissance professional basketball team, at Science Park High School in Newark, NJ. The event was simulcasted live throughout the school, city, and state. 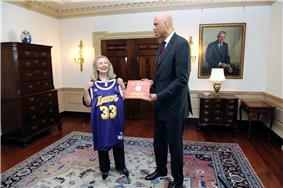 Abdul-Jabbar with Hillary Rodham Clinton. In January 2012, United States Secretary of State Hillary Rodham Clinton announced that Abdul-Jabbar had accepted a position as a cultural ambassador for the United States. During the announcement press conference, Abdul-Jabbar commented on the historical legacy of African-Americans as representatives of U.S. culture: "I remember when Louis Armstrong first did it back for President Kennedy, one of my heroes. So it's nice to be following in his footsteps". Abdul-Jabbar met Habiba Abdul-Jabbar (born Janice Brown) at a Lakers game during his senior year at UCLA. They eventually married and together had three children: daughters Habiba and Sultana and son Kareem Jr, who played college basketball at Western Kentucky after attending junior college. Abdul-Jabbar and Janice divorced in 1978. He has another son, Amir, with Cheryl Pistono. Another son, Adam, made an appearance on the TV sitcom Full House with him. Speaking about the thinking behind his change of name when he converted to Islam he stated that he was "latching on to something that was part of my heritage, because many of the slaves who were brought here were Muslims. My family was brought to America by a French planter named Alcindor, who came here from Trinidad in the 18th century. My people were Yoruba, and their culture survived slavery... My father found out about that when I was a kid, and it gave me all I needed to know that, hey, I was somebody, even if nobody else knew about it. When I was a kid, no one would believe anything positive that you could say about black people. And that's a terrible burden on black people, because they don't have an accurate idea of their history, which has been either suppressed or distorted." In 1998, Abdul-Jabbar reached a settlement after suing Miami Dolphins running back Karim Abdul-Jabbar (now Abdul-Karim al-Jabbar, born Sharmon Shah) because he felt Karim was sponging off the name he made famous by having the Abdul-Jabbar moniker and number 33 on his Dolphins jersey. As a result, the younger Abdul-Jabbar had to change his jersey nameplate to simply "Abdul" while playing for the Dolphins. The football player had also been an athlete at UCLA. In November 2009, Abdul-Jabbar announced that he was suffering from a form of leukemia, Philadelphia chromosome-positive chronic myeloid leukemia, a cancer of the blood and bone marrow. The disease was diagnosed in December 2008, but Abdul-Jabbar said his condition could be managed by taking oral medication daily, seeing his specialist every other month and getting his blood analyzed regularly. He expressed in a 2009 press conference that he did not believe that the illness would stop him from leading a normal life. Abdul-Jabbar became a spokesman for Novartis, the company that produces his cancer medication, Gleevec. In February 2011, Abdul-Jabbar announced via Twitter that his leukemia was gone and was "100% cancer free". A few days later, he clarified his misstatement. "You're never really cancer-free and I should have known that," Abdul-Jabbar said. "My cancer right now is at an absolute minimum." ^ "Kareem Abdul-Jabbar bio". nba.com. Retrieved 2013-06-03. ^ Mitchell, Fred (March 23, 2012). "NBA's best all-time player? You be the judge". Chicago Tribune. Retrieved 2013-06-03. ^ "The Greatest Player in NBA History: Why Kareem Abdul-Jabbal Deserves the Title". bleacherreport.com. Retrieved 2013-06-03. 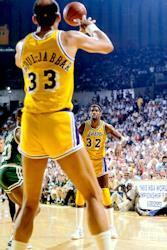 ^ "The growing pains for seven-footer Kareem Abdul-Jabbar". The National. Retrieved 2013-06-03. ^ "Kareem Abdul-Jabbar Biography". espn.go.com. Retrieved 2013-06-03. ^ a b "The Game's Greatest Giants Ever". espn.go.com. Retrieved 2013-07-25. ^ "25 Greatest Players in College Basketball". ESPN. Retrieved 2013-06-03. ^ "Kareem Abdul-Jabbar". imbd.com. Retrieved 2013-06-03. ^ "Books by Kareem Abdul-Jabbar". amazon.com. Retrieved 2013-06-03. ^ "Kareem Abdul-Jabbar named U.S. global cultural ambassador". latimes.com. January 19, 2012. Retrieved 2013-06-03. ^ Biography and Video Interview of Kareem Abdul-Jabbar at Academy of Achievement. ^ African American Registry: Mr. Basketball and much more, Kareem Abdul-Jabbar! ^ Edward E. Curtis IV (June 2010). Encyclopedia of Muslim-American History (1 ed.). Facts On File, Inc.
^ a b c d e f g Hoiberg, Dale H., ed. (2010). "Abdul-Jabbar, Kareem". Encyclopedia Britannica. I: A-ak Bayes (15th ed.). Chicago, IL: Encyclopedia Britannica Inc. pp. 20–21. ^ a b c d e f g h Scavone, Daniel C (2002) . Dawson, Dawn P, ed. Great Athletes 1 (Revised ed.). Salem Press. pp. 7–10. ^ a b Florence, Mal (April 7, 1974). "Papa Sam Gilbert Is Someone Special to UCLA Cagers". Sarasota Herald-Tribune. p. 7D. Retrieved December 22, 2013. ^ Lew's Still Loose. Time Magazine, April 14, 1967. Quote: "First there was the Wilt Chamberlain Rule, designed to force him away from the basket by widening the '3-sec. zone', in which an offensive player can remain for only 3 sec. at a time. Next came the Bill Russell Rule, which forbids blocking a shot when the ball is on its downward course. Now there is the Lew Alcindor Rule. College basketball's rules makers decided last week that players may no longer 'dunk' or 'stuff' the ball by ramming it through the hoop from directly above". ^ Prugh, Jeff (January 14, 1968). "Bruins win again without Alcindor. Big Lew Sidelined By Eye Injury Suffered in Game against Bears". ^ "Going for Gold: A History of Olympic Controversies". Randomhistory.com. Retrieved August 10, 2012. ^ 2009–10 UCLA men's basketball media guide. Retrieved October 26, 2009. ^ Sachare, Alex (1977-10-19). "Kareem kayos Kent Benson". The Prescott Courier. Associated Press. Retrieved 2010-03-21. ^ Simmons, Bill (2009). The Book of Basketball: The NBA According to the Sports Guy. New York City: ESPN Books. p. 133. ^ Thomas, Ron (February 11, 1983). "NBA Notes: Kareem loses a lot". ^ Jonathan Lemire (January 2004). "Keeping Up". Columbia College Today. Retrieved June 10, 2007. ^ "Kareem Abdul-Jabbar Volunteers As High School Coach On Indian Reservation in Arizona". Jet. November 23, 1998. Retrieved June 10, 2007. ^ "NBA History - Rebounds Leaders". espn.go.com. Retrieved 2012-06-29. ^ "All Time Leaders: Blocks". nba.com. Retrieved 2013-06-03. ^ Hartman, Steve; Smith, Matt (2009). The Great Book of Los Angeles Sports Lists. Basic Civitas Books. p. 30. ^ "Encyclopedia: Playoff Edition". NBA.com. Retrieved 2013-06-03. ^ "Hall of Famers". Basketball Hall of Fame. Retrieved August 2, 2009. ^ Remarks With Cultural Ambassador Kareem Abdul-Jabbar. U.S. Department of State. January 18, 2012. ^ Abdul-Jabbar, Kareem (1983). Giant Steps. New York: Bantam Books. p. 227. 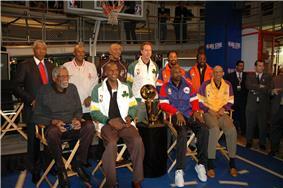 ^ "The Official Website of Kareem Abdul Jabbar » 2008 » March". Kareemabduljabbar.com. Retrieved December 18, 2012. ^ "Double Helix Medals Dinner". Doublehelixmedals.cshl.edu. Retrieved December 18, 2012. Heisler, Mark (2003). Giants: The 25 Greatest Centers of All Time. Chicago: Triumph Books.